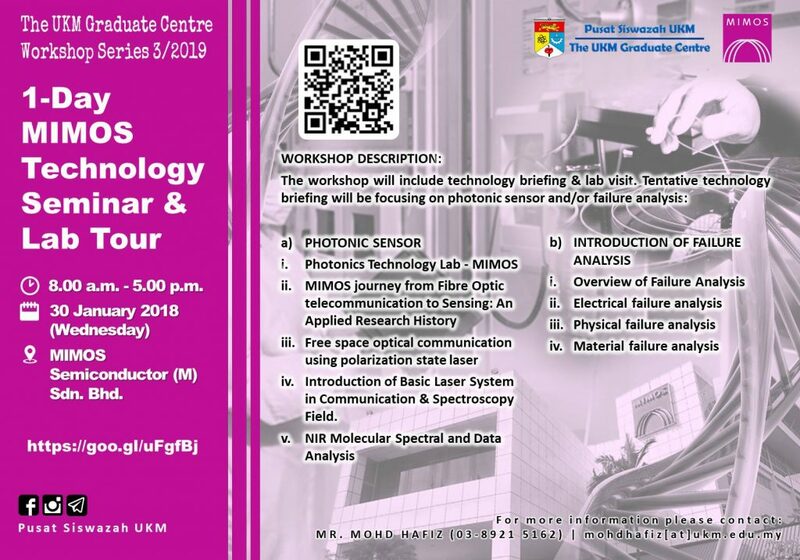 The UKM Graduate Centre is pleased to invite you to join The UKM Graduate Centre Workshop Series 3/2019: 1-Day MIMOS Technology Seminar & Lab Tour in collaboration with MIMOS Semiconductor (M) Sdn. Bhd. � Time: 8.00 a.m. – 5.00 p.m.
� Venue: MIMOS Semiconductor (M) Sdn. Bhd., MIMOS Bhd. Please feel free to contact us for any enquiries. You may contact Mr. Mohd Hafiz at mohdhafiz[at]ukm.edu.my or call 03-8921 5162.